The “Joint Comprehensive Plan”(JCP) – also known as the “Iran Deal” among many – is dangerous for America’s security and demonstrates a true disconnect from reality by those who work towards it’s implementation. This level of delusion reveals a White House and State Department which are devoid of any capability for reasonable thought, or a White House and State Department which are intentionally opening America up to grave danger – even more so than already exists. This assumes that an written agreement is going to keep the regime in Tehran in line. Since 1979, Iran has called for the destruction of America and Israel. We need not look any further than the Iranian Constitution for all we need to know – as if the constant barrage of “Death to America” for the last 35 years isn’t enough. Only a few months ago, Iranian Supreme Leader Ayatollah Ali Khamenei spoke to a crowd of his people while they shouted “Death to America.” He agreed with them saying America was the cause of the pressure on Iran today. 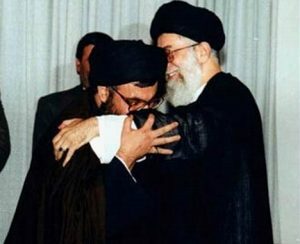 The photo below depicts Khamenei receiving a kiss on his sleeve from Hizbollah leader Hassan Nasrallah, a sign of respect and subservience in Shia Islam. This is who our government thinks we can trust? FYI, Hizbollah is designated terrorist organization. Do our leaders actually believe Iran is working and will work in “good faith” to only use nuclear power for the cause of good when it openly states the nation exists to extend the rule of Islam across the planet and openly embraces known terrorist leaders? (1) the lifting of economic sanctions which will provide Iran with billions of dollars for their global jihad; (2) lifting of sanctions on individuals identified as associated with the nuclear program including Qassem Suleimani, the leader of Iran’s Revolutionary Guard Quds Force. If anyone should not have more free room to move, it is this guy. The JCP goes on to remove all sanctions on equipment for aircraft and other mechanical/technical gear, as well as petroleum and related products. The United States government is giving Iran – a nation which has clearly and openly declared its commitment to global jihad in it’s Constitution and elsewhere – a free pass to billions of dollars, open trade to prepare itself for the coming war, and all it needs to get the nuclear weapons it longs for. Can this not be called “Treason”? Oh yes, I think this can be called treason. No American IAEA inspectors, the President Hasan Rouhani calling for the death of America, refugees pouring in the U.S. directed by the OIC, it’s so obvious that our government has been so deceived by the intelligence officers called the MB, And then on top of that 1.6 billion ? sent to do what help them get their mission accomplished in style? All this after 9/11 and the published 9/11 Commission report (1st edition) …Trump is right, we have stupid leaders and I don’t like the word, but it is such delusion. I am happy Senator Menendez came out against it, but now what, how do they contain this this nuclear spread…? I left a message for Cardin and Gwen Morris.